Oxidizers designed to handle lower VOC concentrations and higher air flow rates with greater thermal efficiency. Air Pollution Control using a Regenerative Thermal Ox-idizer (RTO) is most appropriate in process appli-cations with lower concen-trations (up to 10% LEL) of Volatile Organic Compounds (VOCs) and air flows higher than 5000 SCFM. The chief benefit of installing a Re-generative Thermal Oxidizer System is lower operating costs when compared to other emission control technologies. High energy efficiency, around 95%, is achieved by recovering and reusing the excess heat energy which is created in the process of combusting the organic materials contained in the air stream. It is possible to obtain destruction efficiency in excess of 99% in some cases. Pollution Systems can provide you with new emission control equipment specifically designed for your process application. 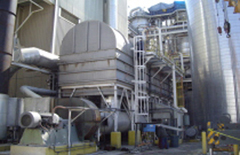 The Regenerative Thermal Oxidizer systems we offer combine first rate design and construction while focusing on reliability and ease of operation. Delivering high-quality systems that enable long-term, continuous operation at an affordable price allows us to provide one of the best values in the industry.